First-year player Michelle Sweeting is juggling time between volleyball and studies in Kinesiology -Photo: U of R Photography Dept. Michelle Sweeting has a lot on her plate. Not only is this her first year at university, but it's her first year as a member of the U of R Cougars women's volleyball team. This might seem intimidating to the average student-athlete entering their first year; however, Sweeting is not that average athlete - she's claimed a starting position on one of the top teams in the nation in her first year on campus. "I'm very excited," Sweeting says. "There's lots of pressure but it's still fun. I like the challenge - playing volleyball at this level is a lot faster." Sweeting is working towards a degree in Kinesiology & Health Studies but has yet to determine her major. She's enjoying being a university student and her favourite parts of university life so far include the independence and the emphasis that's placed on volleyball. The workload in university can be excessive, so what is the biggest struggle a new student-athlete has to deal with? "Definitely time management. There are the three-hour practices, then getting your workouts in - then making time for homework after that's all done," she explains. 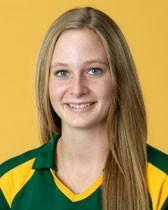 Sweeting is not only new to the team and the U of R she's also new to Regina. Sweeting is from Maryfield, a Saskatchewan town of 369 people located near the Manitoba border. Living in a much larger city can be intimidating, but she says her teammates are making her feel welcome and helping her make the transition to life in Regina. Sweeting will be playing at the middle position left vacant by graduated All-Canadian and two-time conference all-star Beth Clark, who's now an assistant coach with the team. Clark's shoes are definitely big ones to fill, especially considering the strong season the team had last year which culminated in a fifth-place finish at the CIS Championship. Sweeting isn't letting the pressure get to her. "I don't have any expectations," Sweeting says. "I just want to try to do my best out there and keep working and improving each practice and each match." The Cougars will have their home openers on Nov. 12 and 13 against Trinity Western at the Centre for Kinesiology, Health & Sport. For up-to-date news, schedules, and results, visit the University of Regina's athletics website at www.reginacougars.com .